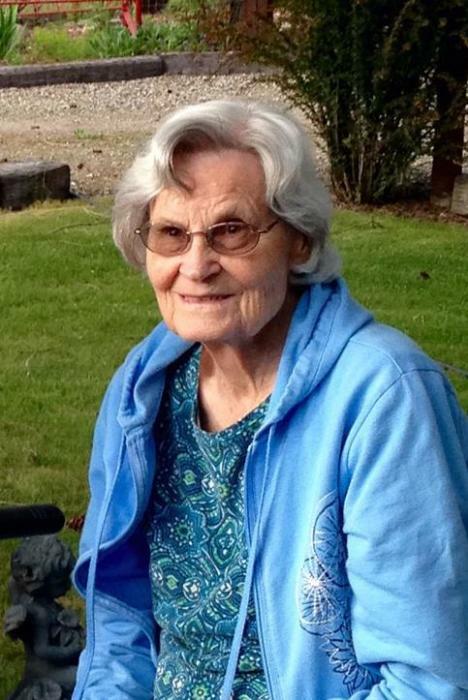 Nora May Auge, 95, of Libby, MT passed away Thursday, March 28, 2019 at the Libby Care Center. She was born August 12, 1923 in Spokane, WA to Warren D. and Frances Stella (Little) Robbe. On May 10, 1941, Nora May married Louis Henry Auge in Coeur d’Alene, ID. They loved their life together. Nora May was a stay at home mom until her daughters Merry Lynn and Alene were in high school. She then worked at St. John’s Hospital in the laundry department and was the first laundress at the Libby Care Center. Together, Louis and Nora May started Faith Bible Church in their home in 1955. The church then moved to the Grange Hall and then to its present location. They also started Pipe Creek Church and many Bible Camps. They loved serving their Lord. After their retirement, they enjoyed camping and fishing with their many grandchildren. They also loved traveling to see their children in Colorado, Alaska, Wenatchee and Leavenworth, WA. They enjoyed their gardens, both vegetable and flower, and had beautiful yards. Nora May was preceded in death by her husband, Louis; her son, Ron Auge; grandsons, Chip and Cliff; and son-in-law, Joe Pomeroy. Mom got her heart’s desire - she is now at home with the Lord, Dad and many loved ones. Survivors include her children Eugene L. Auge (Darlene) of Libby; Sherry L. Pomeroy of Libby; Merry Lynn Grubb (Russ) of Wenatchee; and Alene L Auge of Yaak; grandchildren Jim, Duane, Mark, Margie, Wayne, Barry, Adriane, Todd, Thad, Tarah, Barbara, Bill; and numerous great and great-great grandchildren. Memorial services for Nora May will be 11:00 a.m. Saturday, April 6, 2019 at Faith Bible Church. Arrangements are under the care of Schnackenberg Funeral Home of Libby. Memorials may be made to the Faith Bible Youth Center and Missions. Online condolences and memories may be shared by visiting www.schnackenbergfh.com.